Salti handmade bracelets are the creative inspiration of Cathy Davey, an avid sailor, swimmer, and basic lover of all things ocean. Fashionable, yes. Fussy, never. These beachy chic creations are expertly crafted from the highest quality marine materials including a nautical shackel clasp for easy on/easy off convenience. But don’t worry—there’s absolutely no reason to remove your Salti before getting wet. 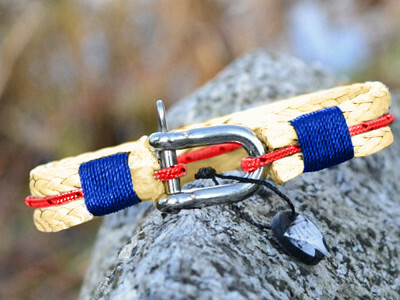 Made to withstand salt water, sunshine, and any kind of weather, the nautical twine and cord won’t shrink or stretch. The stainless steel clasp won’t rust. And, the vibrant colors won’t fade. So, go ahead and surf, sail, or swim in Salti style to your hearts content. Hello, I'm Cathy Davey, Founder of SALTI. 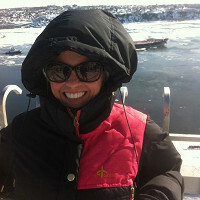 SALTI brings together my love of the ocean and all things nautical. SALTI is an evolution with its roots going back to childhood when at age 8 my father made me a little wooden sail boat. Years of competitive sailing and a stint at the Canadian Coast Guard College gave me ample opportunity for messing about with rope. Being entrepreneurial, I grew the SALTI brand to what it is today - the marketplace for truly authentic nautical bracelets. 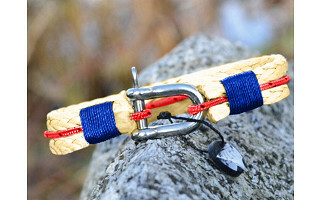 I make the bracelets with sailors, surfer and water enthusiasts in mind. They are durable, comfortable and made to withstand salt water and weather. Plus they look great! I have a few of the Salti bracelets and they are awesome. I never take them off, they are worn in the shower, swimming etc and they hold up really well. They are very comfortable and unique. I get lots of positive comments about them. The only downside is there are too many wonderful ones to chose just one! How many inches long are they when unclasped? In the video they are on a man's wrist. My wrist as a petite woman is quite small in circumference. Thanks for asking. We will be sure to make this clear in our details section. They come in 7 inch and 8 inch sizes. The length is 7 inches or 8 inches in full length including the shackle. The size 7 inch is perfect for the petite woman. Love the bracelets! I'm here in California, I wear a few of these bracelets myself. My surfing friends ordered these same bracelets from Salti. You can wear them anywhere. Ocean, fishing or out for dinner. They are very unique. People are always stopping me and asking where I got the bracelet, I never see them on anyone, sort of cool. They look great and still look the same as when I first ordered them. I ordered 6 more for Christmas presents. I know they will be here on time because my last 4 orders arrived quick. I'm excited! Glad to hear it, Paul. Happy Holidays! We have been stocking Salti bracelets in our store in Melbourne, Australia and they have been getting such a great response. Not only has the service from Cathy been amazing but the product just speaks for itself. Customers who have bought their first have always come back for another for them selves or as a gift for a friend. I highly recommend Salti as they are a great look and are made exceptionally well. Salti handmade bracelets are the creative inspiration of Cathy Davey, an avid sailor, swimmer, and basic lover of all things ocean. Fashionable, yes. Fussy, never. These beachy chic creations are expertly crafted from the highest quality marine materials including a nautical shackel clasp for easy on/easy off convenience. But don’t worry—there’s absolutely no reason to remove your Salti before getting wet.